This Joomla subscription component enables to create, manage and sell (via PayPal and 2CheckOut) subscriptions, allows selected users to see premium content. Content will be displayed to users after purchase a subscription. Joomla membership includes 15 different layouts for showing pricing and packages of your services or creating amazing subscription plan for your users. 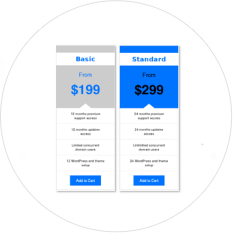 HTML pricing tables come with a lot of parameters to change font, colour, links, etc. Download for FREE 3 columns Pricing Table or get 15 awesome Subscription plans (Joomla pricing tables) in Pro Simple Membership package. 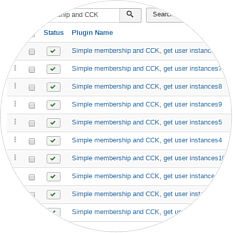 Simple Membership extension supports user and admin email notifications. Users and admin get messages about account creation, approving or disapproving. You are able to set the message text and it will be sent automatically. In Simple Membership you can easily set expiration time of memberships - 5, 10, 30, 60, 90, 180 or 360 days. After the expiry of the subscription, the user will be automatically excluded from the membership list. In OS Simple Membership admin can create unlimited number of membership listings. One user can subscribe to several groups (membership listings). Everybody uses a variety of social networks every day: Facebook, Twitter, LinkedIn, Instagram and others. So we thought why not make your login form more convenient and fast for your customers? We decided to use the most popular social network Facebook and the most popular email system Gmail. If you are a Facebook or Gmail user, you can sign in with your accounts. 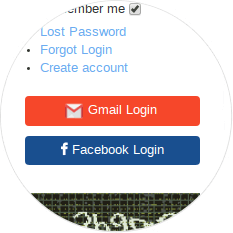 For this, your users need to login via Facebook or login via Gmail and go to your website without any problems. 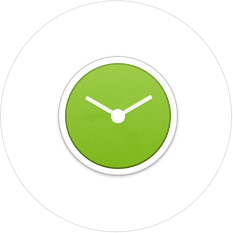 It will simplify the life of your users and save their time! In OS Simple Membership to protect against spammers, we have implemented a Captcha. Use the Captcha in the login form for greater reliability. This will protect you from unwanted users, robots and will not increase the size of the database. You will rarely have to clean the database of your users. It can be disabled/enabled in the module settings. In the new version, we added the ability to select the display of the login form: by default (as before) and in the pop-up (Modal snippet). The modal login window can be styled for any website design with the help of CSS. So, pop up login form is very convenient and now our functionality can be entered into any functional. 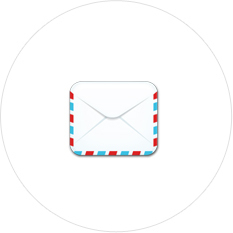 In OS Simple Membership you can send messages to users and receive messages from them. This is very especially on advertisement sites. Also using messaging between users you can create a small professional community based on what you do: the community of real estate agents, cars, books, media products, etc. All messages will be displayed in the tab "SMS messages". All Ordasoft Joomla extensions work well with each other. OS Simple Membership is no exception. It supports Real Estate Manager - Joomla Component for realty management, Vehicle Manager - Joomla automotive extension, Book Library - Joomla eBook Extension, Media Library - Joomla extension and OS CCK - Content Construction Kit for Joomla. Simple Membership Package includes Login module, Last online users module, User profile module, Authentication plugin and Get my books plugin. Install it as Joomla extension via Extension Manager at once. 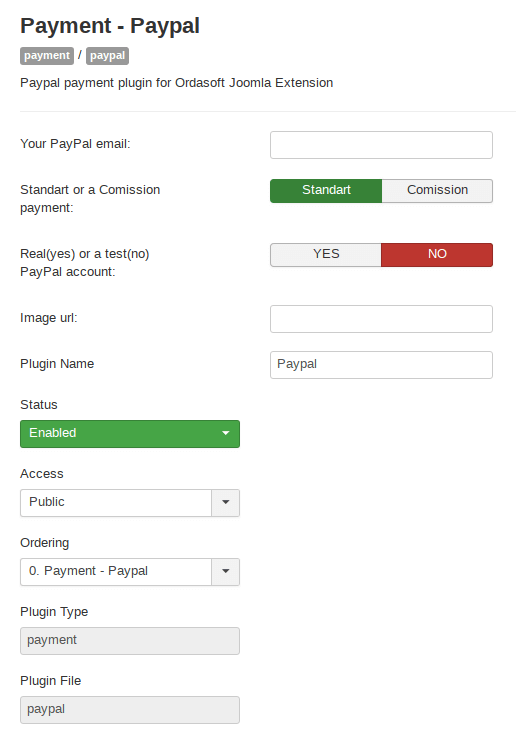 Paypal and 2CheckOut plugins enables to implement function of selling subscriptions and memberships in Simple Membership component. 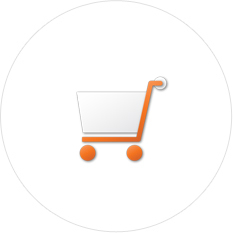 PayPal and 2CheckOut plugins is available only in PRO version of Simple Membership. 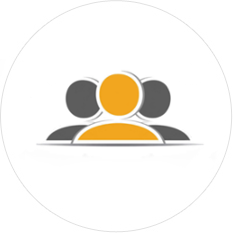 Module last online users enables to show last online users on your website. 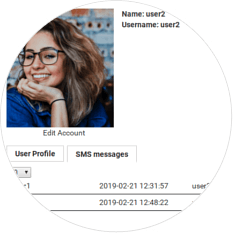 You can specify number of user, which will be shown, orientation (horizontal or vertical), also you can hide or show profile's images and specify Width and Height of them. This Joomla module enables to create login form for users. 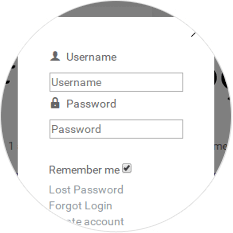 Module login for Simple Membership It has following features: you can specify module class suffix, write pre-text and post-text, specify login and logout redirect pages, show greeting or not, choose name of username of user and specify account maintenance link. 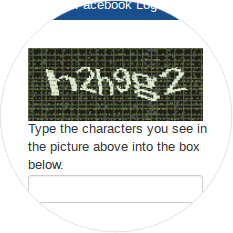 To protect against spam, use Captcha. It can be disabled/enabled in the module settings. Pop-up Login form. You can choose displaying of the login form: by default and in the pop-up (Modal snippet). It is very convenient and now our functionality can be entered into any functional. 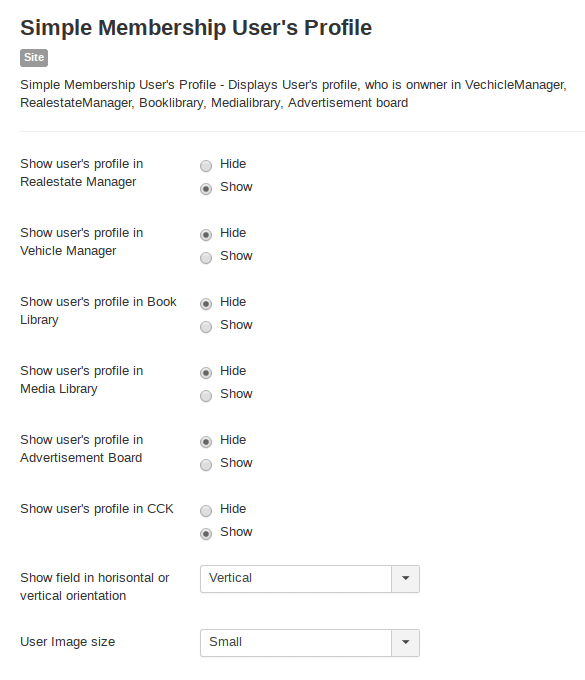 Module user profile helps to show user profile in Real Estate Manager, Vehicle Manager, Book Library and Media Library. You can show fields in vertical or horizontal orientation. Messaging between users. You can send messages to users and receive messages from them. This is very especially on advertisement sites. All messages will be displayed in the tab "SMS messages". Authentication plugin helps to connect default Joomla authentication and authentication of Simple Membership. Get my books plugin helps to show the books (Book Library component) that belongs to certain author. Also such plugin is available for houses (Real Estate Manager), medias (Media Library) and vehicles (Vehicle Manager). 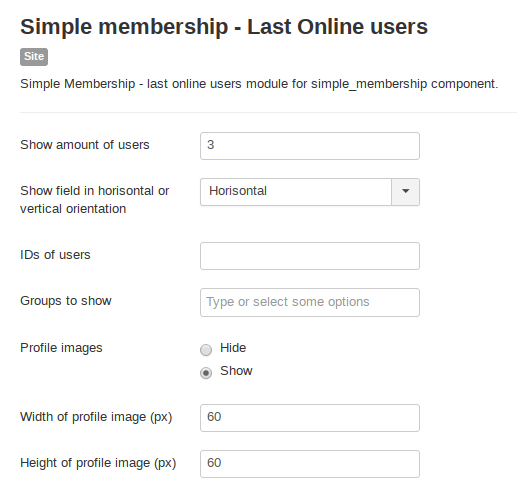 And now OS Simple Membership supports Content Construction Kit for Joomla. 1. How to install Simple Membership extension? 2. How create new subscription group? 3. How to Synchronize Joomla Users with Simple Membership? 5. How to choose subscription plan (Joomla pricing table)? 6. How to create new subscription plan in Simple Membership extension? 7. How to create Joomla pricing table? 8. How to configure Joomla pricing table (subscription plan) for your Joomla website? Migration PHP 7.1 and Joomla 3.7.x.